.......ugh, losing to the Domers really gets ya. .....and a full week off to stew after the loss is not what the doctor ordered. Any chance Mick Cronin can send his Bearcats to Milwaukee so the Golden Eagles can play an extra conference game? Judging from the comments in the game recap below - this one will hurt for while. At least until MU honors the 1977 Natioinal Championship team in style on March 3! So says this optimist. And don't forget, the ESPN Gameday crew will be there for the game -- details on Gameday at MU are available here. In the interim, here's a graphic of the BET matchups based on regular-season records to date. Currently MU is slotted as the 6th seed. 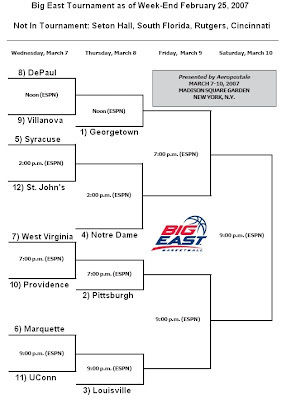 The bracket was created by the guys at MUScoop who update the scenarios on their site daily. We'll link over there daily from now on until the brackets are finalized -- so bookmark this page to follow the changes. Looking further ahead, the Bracket Project has MU pegged as a consensus 5 seed for now. Lets hope that seeding is close to the final. Our record against the teams in the upper half of the bracket is pretty bad, while we've done better against the lower half.